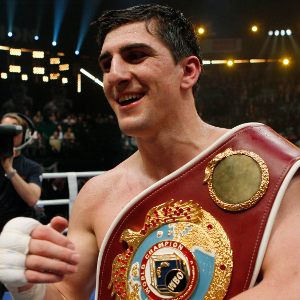 WBO cruiserweight champion Marco Huck (37-2-1) will defend the title August 30 writes the always well informed Bild Zeitung. Site is not mentioned but opponent might be Nuri Seferi (36-6). Seferi won the WBO Euro title in his last fight with a points win over Tamas Lodi (13-2-1). Huck last fought in January when he stopped Firat Arslan. Marco was then all set to take on Italian Mirko Larghetti (then 20-0) March 29 but was injured in training. Roman Jacob's defence of the EBU superfeatherweight title against Devis Boschiero will go ahead August 9 at a venue to be announced. Jacob beat Boschiero at home in Calais (France) the first time around on a close decision. OPI 2000 won purse bids for the rematch and there´s a lot at stake. Swedish supermiddle Naim Terbunja (7-0) have been signed up by Star Boxing in New York City. Naim was an exellent amateur and while in the US on a scholarship he won the New York Golden Gloves and the National Golden Gloves in 2009. In 2011 he signed a contract with Al Haymon but then had big problems getting a work visa and finally turned pro 2012 in Sweden and have until now been a freelancer.